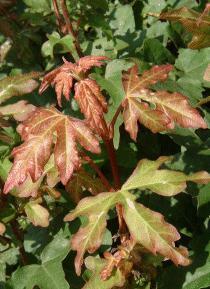 MAPLE, FIELD (Acer campestre). Hedging Plants, Trees, Shrubs and Conifers. Young foliage tinged red. Display hedge at the Garden Centre. 40-60cm £11.45 £10.75 £9.95 - Limited stock available.